The only in-salon service that instantly repairs, strengthens, seals & hydrates hair for up to 4 weeks, in only 10 extra minutes at the shampoo bowl. Immerse distressed hair in a deeply penetrating treatment that renews strength & softness while keeping colour brilliant. Enriched in protein and biotin the Strength Treatment is ideal for damaged and brittle hair. Wrap your fine, thin hair in a veil of super plumping proteins, that bulk up the hair while nourishing at the same time. The treatment will leave hair feeling fuller and more dense for up to 2 weeks. Thank you! We will contact you within 24 business hours to confirm your appointment has been scheduled. Kimberly has been a MHD team member since the very beginning over 10 years ago. She has grown along side the salon to be a senior stylist, and loves clients who aren’t afraid of a change. Kim loves both cutting and coloring hair, but also specializes in formal and bridal styling, which was the first thing that drew her into the industry after watching her older sisters get ready for Proms when she was a kid. When she’s not styling hair, Kim is a hands on mom to two cute girls, loves to bake yummy treats, and spends lots of time with her sisters and mom. Jessica has been in the industry for 15 years and is extremely passionate about helping clients look their best. She enjoys attending beauty trade shows, and continuing to learn new skills. As a senior stylist, Jessica is a great listener and loves to brainstorm new ideas with her clients and mentor our junior stylists at the salon. She specializes in short hair cuts, texture styling, and advanced color techniques. Her experience and creativity helps her master new and exciting looks that her clients love. Outside the salon she loves to spend time with her three kids, host dinner parties with friends, and attend as many music concerts as she can. Melinda has been a stylist for 15 years and loves the fact that her job is new and ever changing. As a Senior stylist at MHD she is well known for her artistic and edgy cutting style and also specializes in curly hair techniques. Melinda has a very large and loyal clientele who rave about her talent and ability to help them make fun changes with their hair often. Melinda is our resident ‘rock star’ … she loves classic rock and has the band t-shirts and ticket stubs to prove it! When she’s not working she is often found playing the bagpipes with her band, the Salt Lake Scots, as well as traveling any chance she gets. 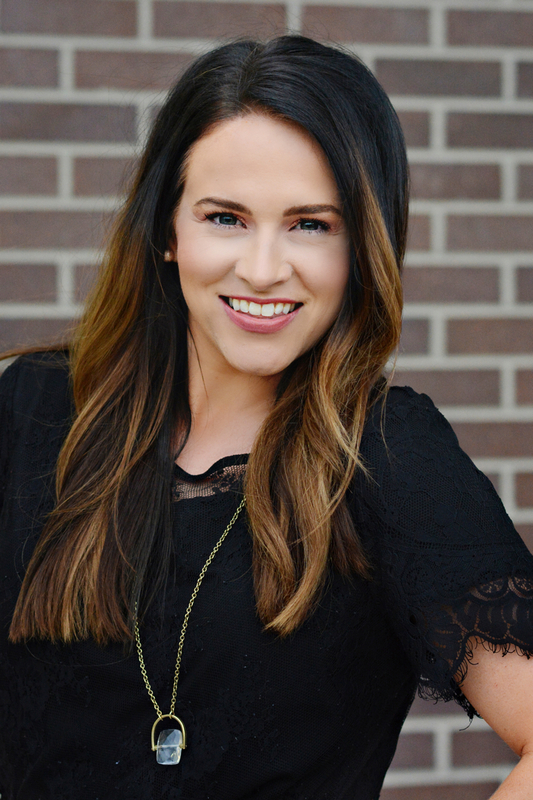 Britnie is a well rounded stylist who loves a little bit of everything, but her extensive training in hair extensions is one of her signature offerings. She decided to pursue her career in hair design while still in high school, because she knew she had a knack for it- and had been doing her friends hair for years. She is certified in Brazilian Blowout and Keratin straightening services, as well as being a licensed Master Esthetician. When she's not styling hair, she's usually skiing- but her latest joy is training for and competing in triathlons. Fun! Chelsea loves the beauty industry for its' ability to transform the way you feel on the outside, but more importantly on the inside. She has been doing hair for well over a decade, and Moore Hair Design is happy to have her on our team for her exceptional makeup artistry and hair coloring skills. She is a MAC certified makeup artist and works with our bridal clients to help them shine on their big day. Outside of work Chelsea is remodeling her home, loves to hula-hoop, and play with her crazy dog and kids! Book with Chelsea online. Holly is MHD's hair replacement expert and has been styling hair for over 20 years. Her expertise and knowledge is apparent and her clients agree. She had an interest in hair at a young age and decided to enter the field with a strong desire to help people. Holly is a hair replacement guru and has worked for the best in the biz when it comes to this unique art. Her long resume includes Squire Natural, Apollo, and Lifelike hair replacement systems. She can customized a hair replacement option for anyone, and her loyal clientele are so happy to have her. Holly loves to sing and travel in her spare time with her hubby, as well as take care of her house full of cute pets. Jen loves a good blonde- and her highlighting skills can attest! Her clients love her advanced knowledge of color, and the training & skill that she has acquired over her 17 year career. She has traveled to New York to take classes at the esteemed Bumble & bumble University, and she loves razor cutting and texture cutting as a result. In her free time she spends time being a wife and mamma to her two beautiful girls. Melissa is best known for creating amazing blondes, and highlights. She is thorough and detailed oriented, and because of that her clients all appreciate her artistry. Melissa also specializes in ombre and balayge color techniques and long layered cuts. She is a graduate of Hairitage Academy and has been working in the industry for over 10 years, with a strong love of her clients and the great friendships that the salon can create. When she is not at the salon, Melissa is a busy momma to three kids, and goes boating as much as possible with friends and family! Jade is our newest stylist to join the hair design team, but has been part of our MHD family for two years working behind the front desk. She is a recent graduate from Taylor Andrews, and is excited to be part of the beauty industry. Jade specializes in mens haircuts and loves to perform creative color and ombre techniques. When not at work, Jade is often found in front of the camera as a model, she loves to travel and play with her adorable son! WE ARE SO EXCITED ABOUT THESE AMAZING NEW COLOUR ENHANCING TREATMENTS. THEY WILL KEEP YOUR COLOUR LOOKING FRESH IN BETWEEN VISITS TO THE SALON. KNOCK OUT BRASS IN THAT BLONDE, OR KEEP YOUR RED GLOSSY AND FRESH. DID YOU KNOW YOU CAN RACK UP THE REWARDS BY REFERRING A FRIEND TO YOUR STYLIST? SIMPLY PRINT OUR REFERRAL PASS ALONG CARD HERE, FILL OUT THE INFO AND PASS IT ALONG TO A FRIEND. THEY'LL SAVE $20 ON THEIR FIRST SERVICE, AND YOU'LL SAVE $20 ON YOUR NEXT SERVICE. LOVE THAT SHAMPOO? BUY IT IN BULK AND SAVE.